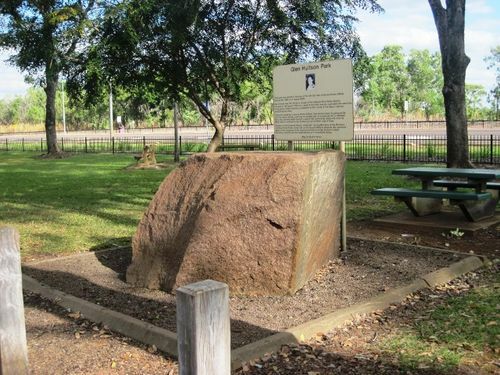 A park commemorates Northern Territory policeman, Sergeant Glen Huitson who was killed in the line of duty. Huitson, 38, was shot dead at a roadblock at the intersection of Stuart Highway and Old Bynoe Road, Acacia, 55 kilometres south of Darwin in 1999. After an hour-long shooting rampage, gunman Rodney William Ansell - said to be the man on whom Paul Hogan's Crocodile Dundee character was based - shot Huitson in his side. A gun battle followed in which Ansell, 44, was shot dead by Huitson's partner, Constable Jamie O'Brien. Huitson died in the Royal Darwin Hospital an hour later. This park was named in memory of the late Sgt. Glen Anthony Huitson BM,VA, Service No. 1520 on 3 August 2000. Sgt. Huitson was the officer in charge of the Adelaide River Police Station. He died on 3rd August 1999 as a result of gun shot wounds received in the execution of his duties whilst manning a roadblock on the corner of the Stuart Highway and Old Bynoe Road. Twice Decorated as a serving Police Officer, Glen Huitson lived his personal life with the same intensity, and was an integral part of community life in Adelaide River. His untimely death has a left a gap in this community which will never be filled. Glen is survived by his Widow Lisa and children Joey & Ruby. Citizens of the Coomalie Region joined with serving Members of the Northern Territory Police Force at this site on 3rd August 2001 to dedicate this memorial stone on the occasion of the second anniversary of Sgt. Huitson`s death. We honour the life and the achievements of a remarkable citizen.